iColumn LV is a fully walk-away system from Lyse, Bind, Wash, Dry to Elute steps. Robotic arm can connect Trinity by itself and move along with the iCartridge to complete whole purication procedure. 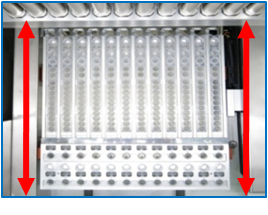 Super Column Technology is a novel solution for automated extraction of nucleic acid from large volume samples. iColumn LV DNA/RNA extraction system with Super Column Technology can extract nucleic acid up to 5 mL sample volume. With the amplication of sample volume, it can highly increase the sensitivity of detection of liquid biopsy. Super Trinity Technology is a combination of Spin Column, Syringe and Column Tip. Utilizing the difference of air pressure, the lysate, buffers, and elution can be easily passed through the silica membrane with reversed ways and finally release the high quality eluted samples for further experimental needs. The iColumn is preinstalled with protocols for purification of cfDNA from wide variety of samples for Cancer Diagnosis , Monitoring the Response to Cancer Therapy ,Non-Invasive Prenatal Testing (NIPT) and Biomarker Discovery. Combined the Trinity and iCartridge Technology. iColumn is able to purify 1-8 or 1-16 samples simultaneously. All samples are placed in independent line to avoid any crossing over. Circulating DNA was purified from 0.25ml, 1ml and 4ml plasma sample by iColumn LV Automated DNA/RNA Purification system with AccuPure Circulating DNA Mini Kit. The relative amount of the GAPDH gene increases linearly with increasing the sample input volume. 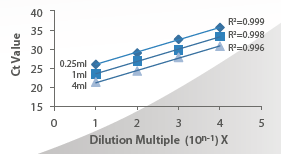 Each eluate from 0.25ml, 1ml, and 4ml sample are serial diluted and performed qPCR to amplify GAPDH gene. 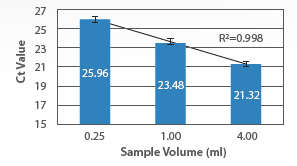 High linearity results show that almost no inhibitors inside of eluate of these samples.